I still have a list of places that have recently opened that I just haven’t had time to get to. This afternoon, J had a hair cut appointment which left me with some more Daddy-Daughter time. By the time J left, L was almost ready for a nap. I hadn’t eaten lunch yet and just wanted a sandwich. There are a few places that have opened recently that have limited sandwich options on their menu that I haven’t been brave enough to drag J to. Since I was by myself, I figured it was time to knock one of my list. The one I chose is a place that has been recommended to me many times since it opened last spring. 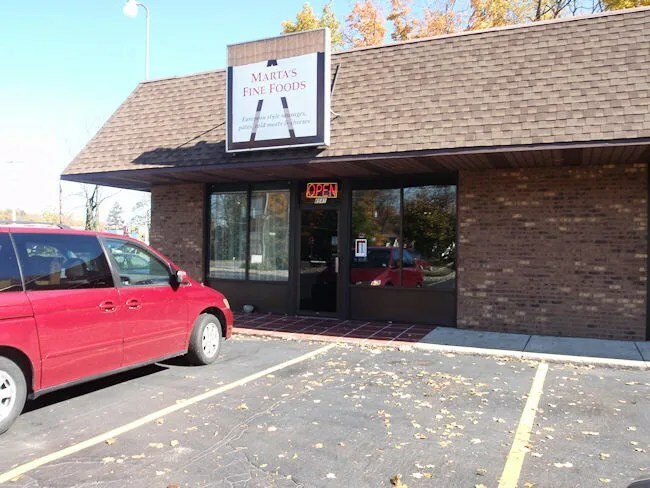 Marta’s Fine Foods is near the corner of Stadium Drive and 9th Street in Oshtemo Township. It actually took over the space that used to be Cool Beans Cafe. Marta’s is more than just a little restaurant situated in a small strip mall. It’s actually a really unique shop that happens to offer a limited lunch menu. Marta’s specialty is European Deli meats and cheeses. They have a display pure of high end meats, cheeses, and sausages on one side of the building which they will give you small taste of to entice you to buy. The other side of the building is a small dining area with a few tables. I walked in to the shop just a little after 1:30. There was one other couple already in the store talking with one of the owners about the wide variety of meats and sausages. When L and I walked in the door, a woman came out of the kitchen and asked how she could help me. Just inside the door is a chalkboard with the day’s menu. From what I’ve seen from other people, the menu tends to change often. On this day, they had a couple of sandwiches, soup, and some fresh grilled sausages from a charcoal grill that was fired up outside. 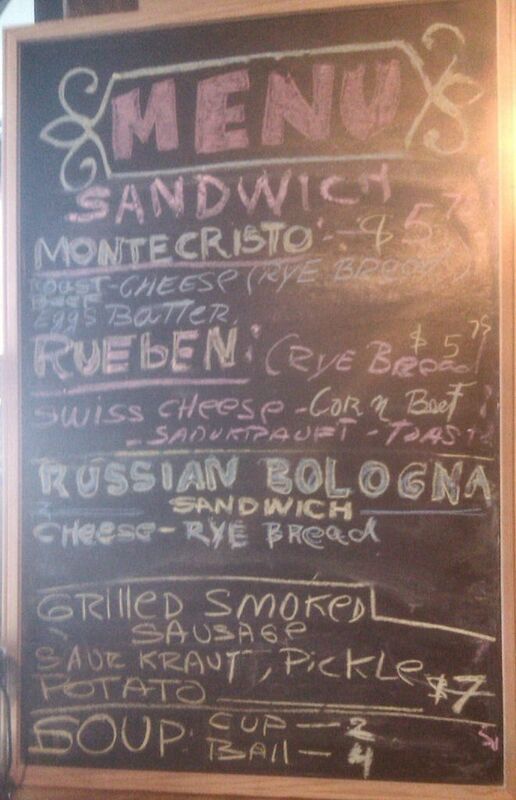 The sandwich that looked the best to me was the Russian Bologna Sandwich. I told the woman who met me (later I heard her referred to as Marta), that I wanted the bologna sandwich and she went to work. She grabbed the meat out of the case and started to slice then turned back to me and asked if I would like bologna or Mortadella. She sliced off a small piece of both and let me choose. The Mortadella had a wonderful flavor so that’s what I chose. After slicing off the meat, she headed to the kitchen to put the sandwich together. I asked if I could get it wrapped up to go because I had a baby that was falling asleep in my arms. I figured I better get home instead of chancing another 15 minutes in a high chair. The whole time I was there, both of the employees were incredibly chatty and friendly. L, of course, was the center of attention as everyone wanted to talk to her while we were drooling over the meat in the deli cases. As the sandwich was being made, the woman came out of the kitchen again and asked if I wanted Sauerkraut . I have never been a fan of sauerkraut thanks to my mom. She loves the stuff, but I never could stand the smell of it. I asked her to put it on the side because I did want to give it a try, but I didn’t want it all over the sandwich. A few minutes after that, I was handed a plastic container with a foil wrapped sandwich, kraut, and a dill pickle. The total was a bit over $5 which I paid for with cash. I passed on the drink because they had Coke products. When I got home, I snapped open the plastic container and dug into the grilled sandwich. 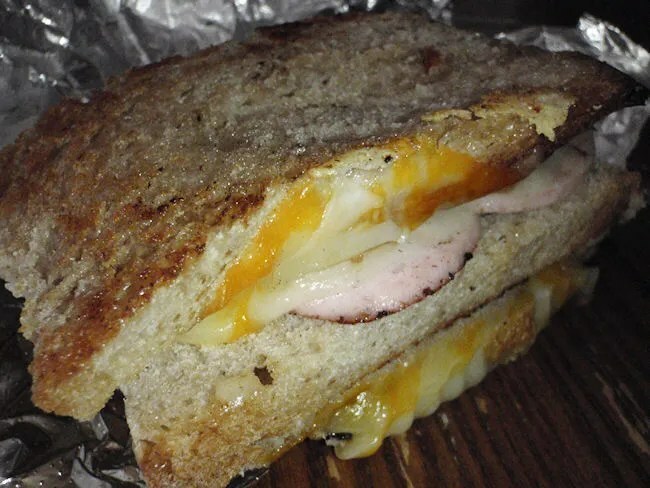 The Mortadella shared the toasted rye bread with at least two kinds of cheeses. I believe they were a cheddar and a Swiss but I could be wrong. All I could tell for sure was that one was white and one was yellow. The sandwich was delicious. It was much more filling that I expected for five bucks. I sort of wish there was either more consistency in the menu or they posted daily menus on their Facebook page. Marta’s is really close to where I live and I’d love to stop in their more often. Marta’s Fine Foods is an interesting addition to this little corner of the world. As good as the sandwich was and as yummy as everything in the deli case looked, the people is what really made an impression on me. did you try the sauerkraut? how was it?